Conor McGregor says the Chechen people believe Khabib Nurmagomedov is a coward. It’s clear to see that things are personal between McGregor and Nurmagomedov. “The Eagle” and his group confronted Artem Lobov in a New York City hotel back in April. McGregor responded by attacking a fighter bus holding Nurmagomedov. McGregor took things a step further by calling Nurmagomedov’s father a coward. McGregor and Nurmagomedov will settle their differences on Oct. 6. The two will collide for Nurmagomedov’s UFC lightweight title in the main event of UFC 229. The championship tilt will be held inside the T-Mobile Arena in Las Vegas, Nevada. Of course, MMA News will have live coverage of UFC 229 from the prelims to the main card. 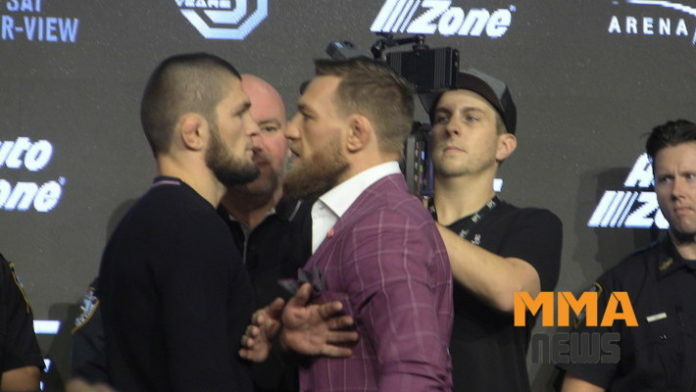 Do you think Conor McGregor’s trash talking is getting to Khabib Nurmagomedov’s head?